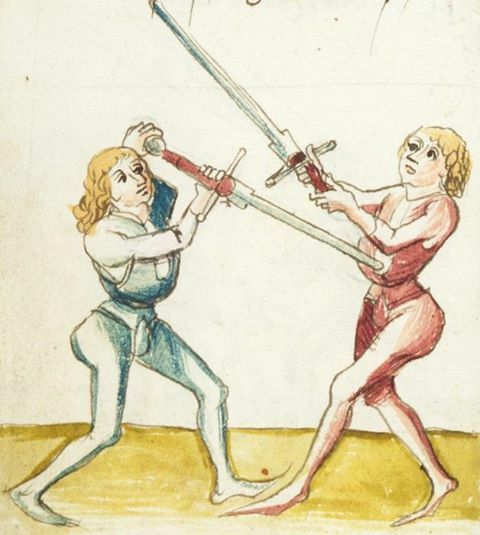 This article amalgamates a series of three posts I made on social media, along with a new concluding section, addressing the various modes of safe attack in the Liechtenauer tradition of medieval combat. along with other martial arts material, and works on such wide-ranging matters as metallurgy, medicine, and astrology. Debate continues as to whether it is the earliest appearance of Liechtenauer’s martial art, and how early it is at all. Regardless of its dating, the commentary offers a viewpoint on the art differing from those found in the other notable commentary works, arguably one more focused on principles than specific techniques. (It may represent a branch of the tradition; one student’s reading of it; etc.) One of these differences is the stress put on the idea of the Vorschlag (“first stroke”) – a concept not explicitly found elsewhere. Repeatedly, the anonymous author lauds the idea of seizing the initiative by ‘winning’ the first stroke – that is, being the first to attack, with a thrust or hewing stroke. Opinion varies today as to whether this means that one should make a dedicated, deep attack, always intended to directly hit the opponent, or if the intent is to use the Vorschlag to bridge the gap between wide and close measure. My own opinion now is that, depending on the situation, the Vorschlag can accomplish either. The commentary in 3227a tells us that one should ‘win’ or ‘gain’ the Vorschlag, and that this independent of whether one has “hit or miss”. After the Vorschlag has been won, one should then (regardless of whether they hit or miss) strike the “after stroke” – the Nachschlag. Now, surely this cannot mean that we would attempt to break wide measure only to outright miss both sword and opponent. More sensibly, it applies only to whether we have hit the opponent or not. Fencers A and B close to wide measure, with A initiating an attack. Fencer A elects to close carefully from wide to close measure, using the initial attack – the Vorschlag – to safely bridge the distance while maintaining control of the center – the line of engagement. To this end Fencer A strikes such that their point is a constant threat to B, closing just enough to come into Langenort (“long point”) in front of B. Such a strategy is consistent with the precept, found in 3227a and many other places, that one “strike while approaching to his head or body, keeping your point before his face or chest.” This is all the more resonant, given 3227a’s praise of the sword’s point as the center of all swordsmanship. Such a strategy is touted even more strongly in the chapter on Sprechfenster (“Speaking Window”) as elucidated in the later commentaries. Using this conservative entry paradigm, we can imagine three basic outcomes. In the first, Fencer B remains where they are, and Fencer A ends in the guard Langenort with the point before the opponent; A is now free to continue on in with a Nachschlag to strike B. In the second, Fencer B also steps forward, and now A’s stroke or thrust has sufficient reach to strike B in one tempo. In the third, B also steps forward, but parries A’s Vorschlag (but A can still now strike a Nachschlag). So, even with a conservative entry strategy, making full use of the threat of the point, we might hit or miss. In all three scenarios above, you still ‘win’ the Vorschlag – you’ve struck first, put your opponent on the defensive, and…have closed distance safely, without being struck. Of course, option 3 is also the one that offers Fencer B a way to turn the tables and regain the initiative, by reacting in a way that not only parries (or, alternately, avoids the attack) but involves a counter attack; but the point, for our purposes here, is that the defender *must* react or be struck. Now, reading the earlier parts of Hs. 3227a, it might be easy to conclude the above is the only safe way to bridge wide measure with the Vorschlag. Read further, however, and it becomes clear that there are other options for safe entry into the fight that involve more *direct* attacks – ironically performed by *indirect* entries. 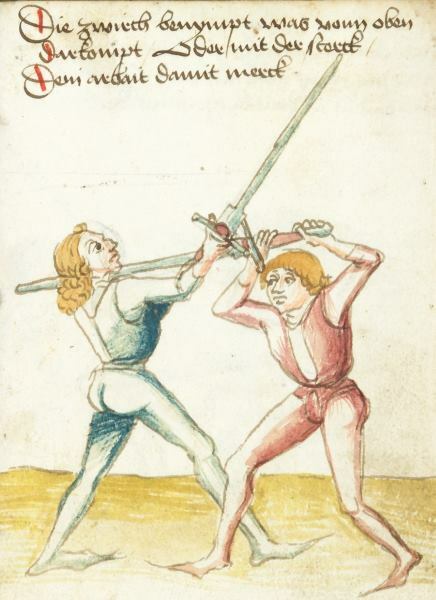 In the chapter on the Twerhau (“Thwart Stroke”), the author sings its praises, telling the student explicitly to enter with that blow employed as a Vorschlag and to directly hit the opponent in the head, such that the blade “tightens around the head like a belt”. Experienced practitioners will find this an apt description of the way the Twerhau (elsewhere, including below, rendered as Zwerchhau) wraps around the victim’s head. Certainly, the description seems to assume an approach that allows for this to happen, even if the opponent remains on guard. How is the ‘Twerhau as Vorschlag’ attack a safe entry? Well, unlike our ‘drive down the center’ scenario earlier, the Twerhau does not own or control the current centerline, but rather creates a *new* line of engagement due to its being executed with a deep step outward and forward to the right with the right foot. The angle of the attack requires much more committed action on the part of the defender. Further, the high line used by a Twerhau targeting the head grants it considerable reach. Of course, once again, Fencer B can still parry this attack (that is to say, Fencer A now ‘misses’), forcing A to continue on with the Nachschlag, often a Twerhau to B’s other side. In short, there are various ways to find safe ways into the fight; choosing a deceptive angle of attack is just one of them. Winning the Vorschlag does not require “hitting the other guy”, but rather seizing the initiative, through various means, in a fashion that forces their reaction. Neither should this require an extremely powerful, fight-ending blow, but instead one just committed enough to force a response. That said, winning the Vorschlag doesn’t preclude hitting the opponent either – as we have seen, this is situational. What 3227a does stress is that ‘hit or miss’, the Nachschlag should always be struck immediately after the Vorschlag. The Vorschlag’s primary purpose is to seize the initiative and enter the fight, not kill the opponent in one tremendous decapitating blow. The assumption therefore is that it won’t be your last stroke, simply one that engages, perhaps wounds, and certainly draws a response. All of this is, naturally, very simplified, but hopefully illustrative of the diverse ways one can employ the Vorschlag for safe and conservative entries into fights. Much goes into whether one hits or misses with an initial attack – time, measure, line, and the opponent’s intent and/or reaction. There is more than one way to win the Vorschlag, and with it one comes to the fight in relative safety, “hit or miss”. In part 1 of my exploration of the Vorschlag, a fencing concept expressed in the German medieval manuscript Hs. 3227a, I opined that it could be employed in diverse ways, including simply gaining the center, or directly assaulting a target using an off-angle attack. I’d like to turn our attention now to four examples of using this concept – the Vier Versetzen (“Four Oppositions”), the four strokes of the sword used to ‘break’ Liechtenauer’s four primary guards for the longsword. A deep reading of the commentaries reveals a layered set of plays designed for attacking opponents of varying skill levels. I will present this first succinctly, and then expand upon each in turn. In short, the first option for each stroke given to us by the masters is a single tempo, first intention attack. What follows are techniques for breaking a particular guard relying on second intention attacks. The former should work against less skilled opponents; the latter against the more highly-trained ones. Krumphau (“Crooked Stroke”) breaks the guard Ochs, employing an attack across the line of engagement coupled with a deep outward step to strike the hands. The angle of attack creates safety. Zwerchhau (“Thwart Stroke”) breaks the guard vom Tag, closing the guard’s high line of attack and also re-angling for safety using footwork per the Krumphau above. Schielhau (“Squinting Stroke”) breaks Pflug by striking into the line against the opponent’s sword with the sword inverted, gaining contact with the blade and then flowing into a thrust into the chest. A modified version of this attack is also leveraged against the extended guard Langenort. Safety is created by directly addressing the opponent’s sword. Scheitelhau (“Scalp Stroke”) breaks Alber by attacking along a high line, outreaching the lowered sword of the defender. Properly timed, it also deceives the defender into reacting too soon, and strikes the scalp line or face of the opponent. Safety is created through superior reach and by a trick of timing arising from driving the hands high to attack. These are the ‘platonic ideal’ plays of the strokes used to break the guards. Of the three, only Schielhau explicitly makes contact with the sword before finalizing the attack. The remaining three go right for a target, using either angle of attack (Zwerchhau & Krumphau), and/or advantages in measure and timing (Scheitelhau) to directly do so; contact with the opponent’s sword may or may not occur. These first intention attacks are less likely to succeed against a seasoned swordsman, particularly one trained within this system of fighting. Fortunately, we have alternative implementations of these four strokes, doubtless designed with trickier opponents in mind. The mindset behind these could be explained colloquially with the phrase “be careful, don’t go for broke on the first shot!” The following actions, explained in the glosses after the platonic ideal exemplars, rely on either a pre-planned second intention attack, or in the attacker being able to deftly respond (in the moment: Indes!) to the imminent failure of the already discussed first intention actions. That’s just fancy wording for this advice: “if they’re too smart and are on to you, shift gears. If they’re really smart, plan to do that from the get go”. All of this should make better sense when we step through each of the strokes’ second intention attacks. I will proceed in Liechtenauer’s order, from Krumphau through Scheitelhau. The Krumphau’s first intention attack upon the guard it breaks, Ochs, is to assail the hands. 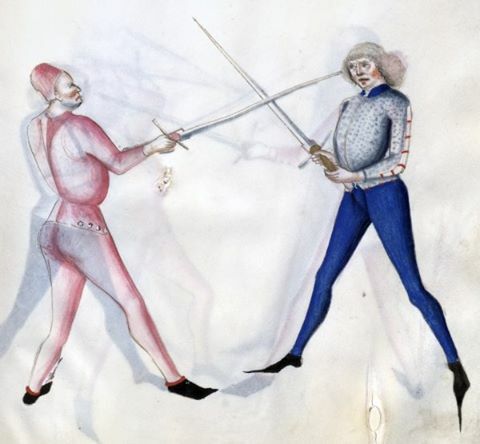 Should the attacker gauge his opponent to be too wily for such a stratagem, they might instead feint an attack to the hands and then, in second intention, fall short with the stroke to ‘change through’, that is, pass beneath, the defender’s blade and strike beneath it with thrust or cut. This might also occur if the attacker, keen on the first intention attack to the hands, and seeing the defender pull the hands back, then changes through beneath the defender’s Ochs. The Schielhau can be used to attack Pflug in first intention by striking with the short, or back, edge to the defender’s blade, commuting the stroke to a thrust to the chest in an extended tempo. Fighting a more skilled defender, the attacker might strike such that they can readily change through below the opponent’s defending point, to thrust anew outside the defender’s sword. Again, this can be done pre-planned, or in response to the defender leaving their guard to parry. The Scheitelhau break Alber by overreaching that low-lying guard. Knowing the defender is apt to raise their sword, likely into a position akin to the position called Kron (“Crown”), the attacker can, in second intention, either let their sword ‘rock’ over the defender’s weapon to the thrust to the face, or invert the sword upon contact to thrust down to the chest. Note here that a) the attacker has a choice of second intention actions, depending on the defender’s commitment, and b), the latter option works best as the ‘pre-planned’ choice. In all the above examples, the second intention options follow after the ‘platonic ideal’ first intention ones. Fighting savvier opponents demands that one leverage more sophisticated options. Conversely, less sophisticated opponents should be attacked in first intention; dazzling them with compound attacks is likely to confuse them, increasing the likelihood of drawing an unpredictable reaction…and risking the dangers of a double kill. Also note – and this is important – that the second intention attacks are ‘shallower’; they seek less distant targets, incurring less risk against a more dangerous defender. In Liechtenauerian lingo, we could say the second intention actions proper (those that are planned) are all Fehler (“Feints”), while the ‘unplanned’ application of those actions are done Indes (“During” or “Instantly”). In any case, all of these attacks are examples of Vorschlag, and Liechtenauer’s treatise is laid out, quite purposefully, to ensure that we are trained to seize the initiative with not only courage, but foresight. The Liechtenauerian term Nachreisen translates into English as “chasing”, “pursuing”, or, more literally, “traveling after”. It is mentioned early in the glosses of Liechtenauer’s Zettel for the longsword and later merits its own chapter. Nachreisen describes methods for exploiting opportunities offered by the opponent’s management (or mismanagement) of timing and/or measure. Nachreisen manifests in two basic forms. One form involves pursuing the opponent when they miss and attack. If your opponent strikes at you with extension, but you don’t let them connect, you can strike them with relative impunity as their blow goes by. The miss is an opportunity. Of course, the opponent may react in time as you strike toward them, parrying your timed counterattack. One then continues to follow the opponent’s actions, but now in contact with their sword. This means that you should learn Chasing well, which is twofold. The first do when he wants to strike to you; then note when he jerks the sword up for the stroke, then follow after him with a stroke or thrust to the upper opening before he can come against you with his stroke. Or, fall with the long edge above to his arms and thereby press him from you. First you should seek them from the Zufechten with the Chasing [Nachreisen], and by shooting into the Langort [Longpoint]. However, just how and when one employs Nachreisen in this capacity is left open. We’re therefore fortunate in having Ringeck’s comments. Following an opponent’s retracting movements needn’t involve them charging a stroke. They might also pull back to prepare a thrust, or move from a guard that closes a line, such as Ochs or Pflug, to an open guard like vom Tag or Alber. Each of these cases lessens the threat from the opponent’s point by retraction of the blade or its being angled out of presence. Removal of threat is a de facto dropping of defenses and therefore an opportunity for attack. Nachreisen facilitates either of the Vorschlag strategies discussed in Part 1. That is, you can either make a shallow attack to gain the center or drive a deeper, more committed, attack, with even greater safety if you exploit retreating motion on the part of your opponent. This principle also informs the guard-breaking strategies described in Part 2. Exploiting wasted movement as an opponent forms/changes guards adds another level of surety and safety on entering the fight. Hence, Nachreisen is a powerful tool in seizing the initiative…in striking the Vorschlag. Its applications, described in the mid-point of Liechtenauer’s treatise, are, as the ‘Von Danzig’ commentaries have it, “diverse and manifold”. We should not be surprised to find these strategies in Liechtenauer’s teachings, elucidating various attack strategies. Writings by later Italian masters of fence are still more succinct, and yet accord with all I have put forth above. Giovanni dall’Agocchie, writing in 1572, defined five tempi (times) for striking the opponent. I list these here (with thanks to Tom Leoni), along with correspondences found earlier in this article. Nicoletto Giganti adds another, also easily understood through the lens of Liechtenauer’s art: you can attack when your opponent waits too long in a guard. Here, one may very safely attack into the center, the opponent’s reaction time protracted by their relaxation into stillness. The Liechtenauer masters’ modes of attack are not novel. Rather, they represent manifestations of universal fencing laws, well understood across the centuries.